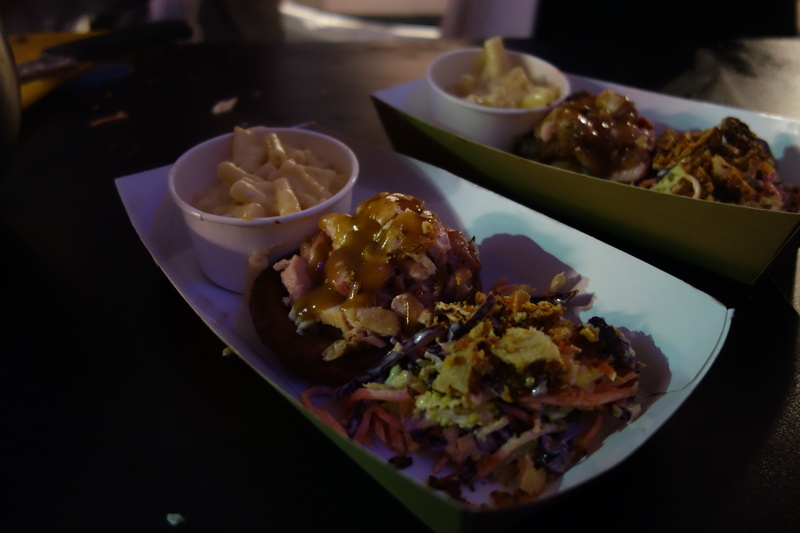 Street food has been making some more regular appearances in Oxford recently, thanks to the great people at Bitten Oxford, and I’ve been going on about their events to anyone who will listen. 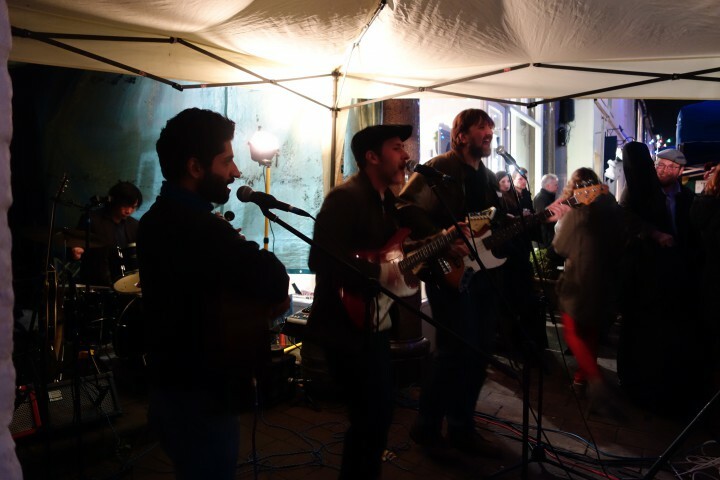 This time it was a joint effort with the North Parade market people, for an evening market. The weather co-operated as much as it possibly could in late November, there was music and there was great food for not very much money at all. We started off with a lamb and salsa verde roll (£5) from Ross & Ross which I failed to get a picture of as I was too hungry, but I’m sure you can imagine a lamb roll. The lamb was slow cooked and then crisped on a hot plate, and there was plenty of herby sauce to cut through the richness. It made for pretty messy eating. We then managed to piss off everyone in the queue behind us by having the very last bits of pork belly from Smoke Yard Kitchen. That’s not the best photo in the world, but there are slices of pork belly, smoked in a Green Egg I think, in a Yorkshire pudding (£5ish). That’s pretty genius, so much nicer than a normal roll or bap, and I regretted my sharing strategy. We had it with some coleslaw topped with extra pork crackling, and I couldn’t resist a small portion of their macaroni cheese (£2). I was gutted to miss out on the Barefoot Kitchen‘s bacon brownies – apparently they disappeared before they had even finished setting up! I’m heading straight for them next time. 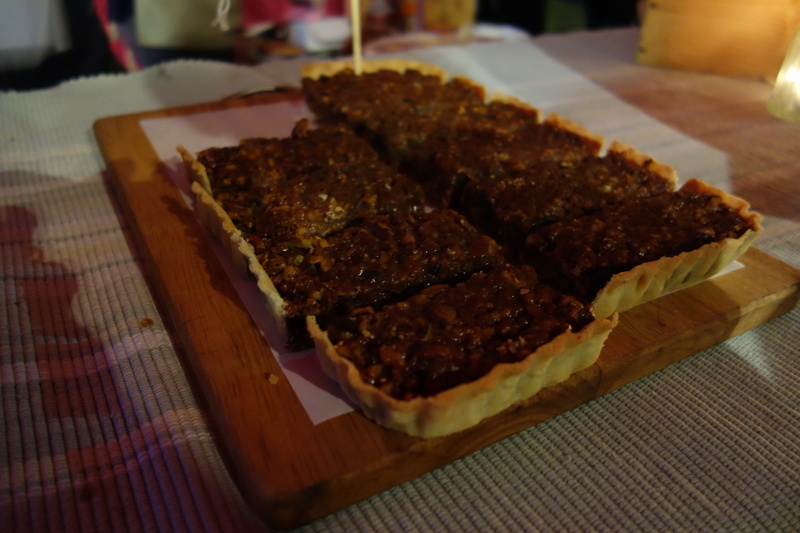 I took a slice of the pecan pie home to console myself and had it with some whisky. Delicious, though probably not the wisest on a schoolnight. The next event is this Saturday 20th December at the Oxford Castle Quarters, from midday till 8pm. I’m planning on going for lunch, braving the Christmas shopping crowds because I’m disorganised and leave everything to the last minute, and then returning for dinner. You should too.